PEDAL is hold­ing its fourth apple day cel­eb­ra­tion on Saturday 26 October from 2 – 4.30 pm at the Donkeyfield Community Orch­ard, Brunstane Road South. 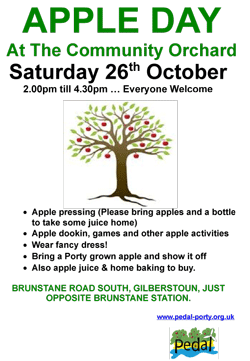 We will be press­ing apples to make our own deli­cious juice — please bring a bottle to take some away in. We also hope to have some of our own tasty apples for you to taste. There will be a bon­fire, refresh­ments and home bak­ing, plus fun and games (includ­ing apple dook­ing and bat the rat!). Please bring any spare apples you may have. Also apple juice & home bak­ing to buy. All wel­come — we hope you can join us. Looking for­ward to the apple day. I don’t have any of my homegrown apples left, but I have hun­dreds of pears — can I bring them for juicing?